The annual rate of new home sales fell 7% in December, signaling a slowdown in the long housing recovery, but total sales for 2013 wound up the best in five years, the Commerce Department reported. The supply of houses for sale rose only slightly for the third month in a row, and the median sales price increased more than 4% from December 2013. For the second time in three months, durable goods orders declined in December, led by a drop in commercial aircraft orders. Even without the volatile transportation sector, orders declined for the first time since September, raising some doubt about recent signs of strength in manufacturing. The Commerce Department reported that a proxy for business investment slipped for the third time in four months. U.S. home prices continued to rise in November, suggesting further progress in the housing recovery. The S&P/Case-Shiller Home Price Index showed a 12-month increase of 13.7%, the most since February 2006. All 20 cities in the composite index improved from year-earlier prices. A housing economist for Standard & Poor’s said price gains should slow down but that housing will keep contributing to economic expansion in 2014. The building blocks of consumer spending – consumer confidence – rose in January more than analysts expected. The Conference Board said its monthly index showed consumers’ assessment of current conditions as well as their outlook for the next six months improving. An economist for the business research group suggested consumers could add momentum to economic expansion in the months ahead. 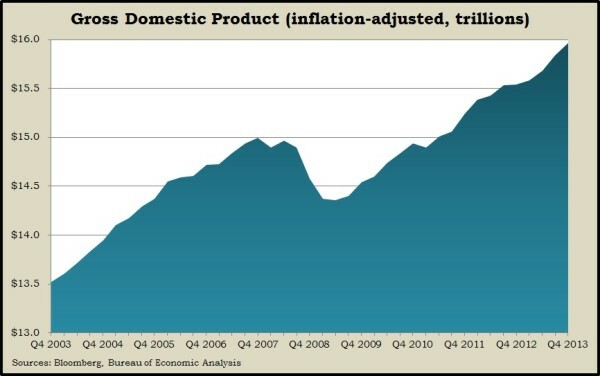 Consumer spending, commercial development and inventory growth helped the U.S. economy expand in the final quarter of 2013, although drops in federal spending and housing construction slowed the pace from the previous quarter, the Bureau of Economic Analysis reported. The Gross Domestic Product grew at an annual rate of 3.2% in the last three months of 2013, down from 4.1% in the third quarter. Consumer spending, which drives 70% of economic activity, equaled its 50-year average rate of 3.3%. A key measure of inflation was less than one-third of its historic average and well below where the Federal Reserve has targeted as an indicator of self-sustaining economic health. The National Association of Realtors partly blamed extreme weather for another decline in pending home sales in December. The trade group’s gauge of contracts expected to close in coming months dipped for the third month in a row and for the seventh consecutive month on a year-to-year comparison. The Realtors said a lack of houses to sell and prices rising faster than incomes also held back sales. They expect pent-up demand to keep 2014 sales levels on par with 2013. The moving four-week average for initial unemployment claims rose for the first time in four weeks, although it still remained below the 47-year average. The Labor Department report offered further evidence that employers are somewhat hesitant to let current workers go. Consumer spending remained relatively strong in December despite negligible gains in personal income, the Bureau of Economic Analysis reported. Personal spending gained 0.4% after a 0.6% increase in November, which was more than previously estimated. The saving rate dipped near the five-year low, suggesting consumers will need more income or more credit to keep spending. After-tax income dropped 2.7% from December 2012, a result of sequester tax increases and expiration of a payroll tax holiday. It was the biggest such decline since 1974. A key inflation measure registered a 1.2% annual rate, below the Federal Reserve target of 2%. Consumer sentiment ticked up from mid-January but ended lower than December, according to Thomson Reuters and the University of Michigan. The reading was slightly higher than analysts expected and suggests further challenges in sustaining consumer spending. In particular, consumers continued to reflect well on current conditions but expressed less optimism about prospects six months from now.